Georgia Avenue Winter Fest this Saturday: music, food, arts & crafts, fire truck, Christmas tree sales, a lot more! This sounds really awesome: Georgia Ave Community Development Task Force and the Georgia Ave and Lamont Public Safety Task Force have organized a big festival, the 1st annual Georgia Avenue Winter Fest, which is coming up this Saturday. The event has a lot going on: live music, performances, arts & crafts, food, a fire truck(! ), Christmas tree sales, local nonprofits and organizations, and a ton more. It's 11am-4pm in the old Murry's Grocery space at 3400 Georgia Avenue NW -- the space has been empty for some time and it was rehabbed by owners and developers Zuckerman Gravely for the event. 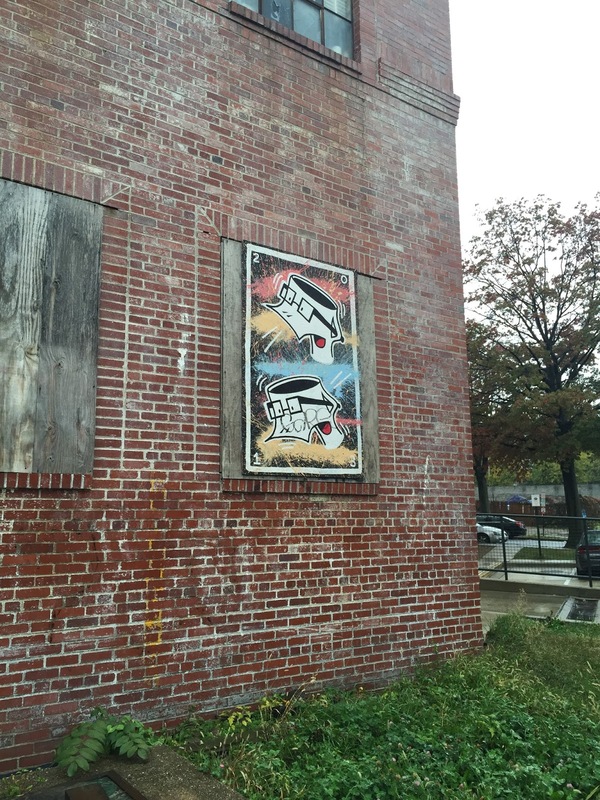 That's pretty cool -- some good temporary reuse of an abandoned building. It sounds like a really fun event for kids and adults, families and folks shopping for the holidays. Here's the full press release with all the details. I'm pretty excited. 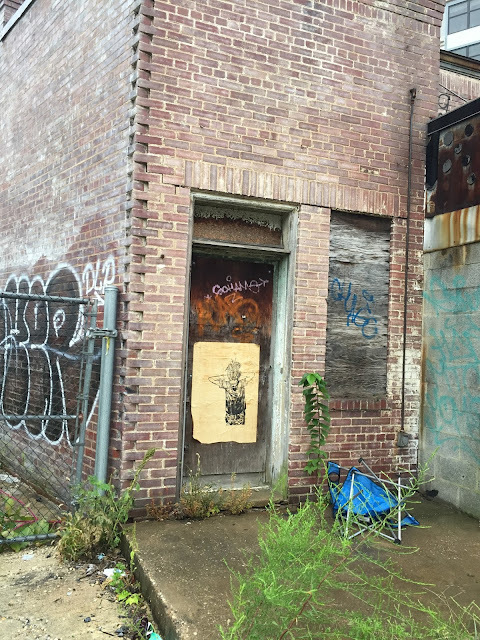 A DC community is harnessing community assets to repurpose a currently vacant building and create a safe, fun, space for neighbors to connect, engage and celebrate their neighborhood. 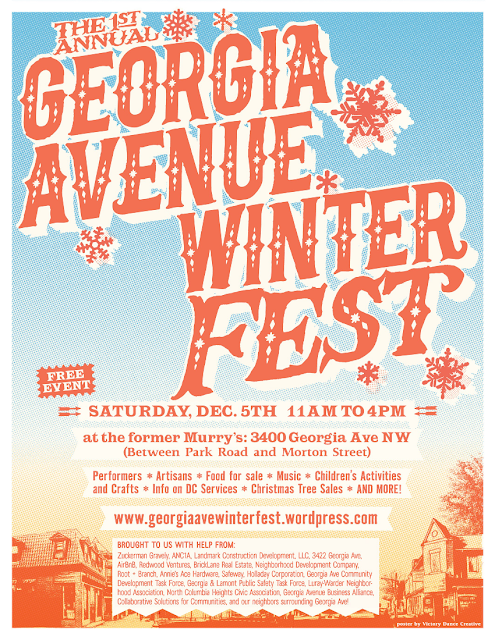 The Georgia Ave Community Development Task Force and the Georgia Ave and Lamont Public Safety Task Force will host the 1st Annual Georgia Ave Winter Fest: a neighborhood-wide demonstration of the positive aspects of the Georgia Ave corridor, such as the strong community spirit and activism and the exciting and engaged local businesses in the community. - Discover additional ways to get involved in the community. You can learn more about the event at www.georgiaavewinterfest.wordpress.com. And here's more about the organizers"
The Georgia Ave and Lamont St Public Safety Task Force is a grassroots neighbor-led response to the rising crime on the 3200 and 3300 block of Georgia Avenue in 2015. They are working with the local police, ANC, City Council and the Mayor’s office to help coordinate neighbors, businesses and city services to help improve the public safety in the area. By collaborating with local neighborhood community groups, developers, business owners, city leadership and fellow neighbors, they have increased camera surveillance and law enforcement presence, conducted regular neighborhood clean ups, addressed nuisance and long term vacant properties, and brought in mobile health units to the area. They are also working diligently to create placemaking activities and experiences to give neighbors ways to connect and engage, such as the 1st Annual Georgia Ave Winter Fest. The Georgia Avenue Community Development Task Force is a grassroots organization that was formed to ensure equitable development and opportunities exist for current residents along Lower Georgia Avenue. We all want to see Georgia Avenue thrive. But we want to see housing and retail come online that is affordable and desirable to the people that live here. Whoa! 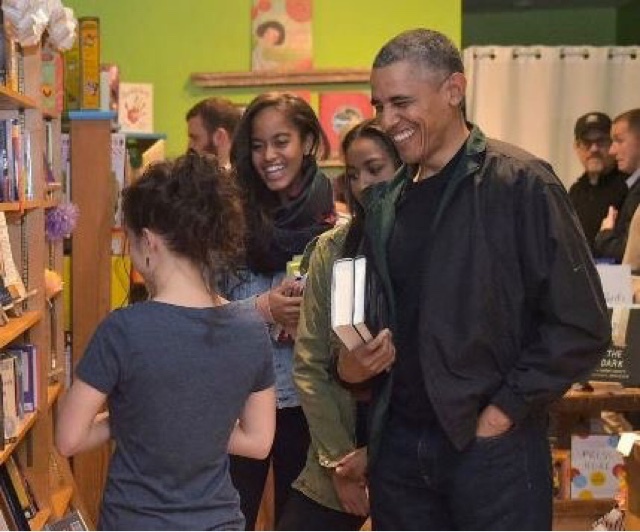 A buddy reports he spotted President Obama and his daughters at Upshur Street Books earlier this afternoon. Presumably Barack, Sasha and Malia were shopping for Christmas gifts on Small Business Saturday, which is today. 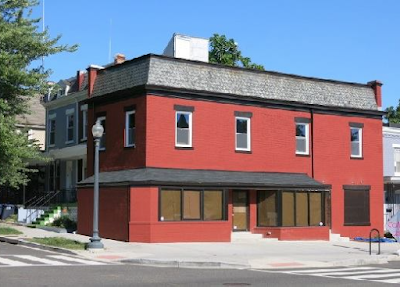 Pretty awesome for our area, the burgeoning Upshur Street strip, and the owners of Upshur Street Books, the folks behind Room 11, Crane and Turtle, Petworth Citizen and the coming soon Slim's Diner. Looks like Upshur Street is getting a bit more busy: Twisted Horn, the cocktail bar from the folks behind Hank's Oyster Bar (and formerly Commonwealth on Irving Street) is aiming for an opening in December, according to Petworth News. Previously we heard the spot will have about 40 seats inside and another 40 outside, and will have classic and new cocktails, rotating beer and wine, and small bites for food -- sounds kind of like the idea behind Room 11, but larger. The opening beverage list features unique drinks such as Scarlet Billows: Blackwell Rum, Camparno Anitca, Fresh Blood Orange Juice; Ghostwood Development: Jensen Old Tom Gin, Sapins Liqueur, Port, Salmiakki Dala Scandinavian Fernet, Whole Egg, Black Pepper Nutmeg; and Black Hat: Maker’s Mark Bourbon, Grapefruit Juice, Housemade Cinnamon & Clove Demerara Syrup, Angostura Bitters. Guests are invited to snack on small bites to accompany their carefully crafted beverages. Jamie Leeds has designed a menu consisting of bar favorites and colorful tastes, such as Assorted Pickles, from their neighbors Gordy’s Pickle Jar; Crostini, choice of Pimento Cheese, French Onion, Spicy Carrot, Chopped Chicken Liver; Onigiri Japanese Rice Balls, choice of Pickled Vegetable, Tuna Tartar, Smoked Salmon, Ume Plum Paste; and a curated selection of Cheese & Charcuterie. If you recall, Hank's owner Jamie Leeds opened Commonwealth, a British gastropub, a few years ago in the space that is now Acre 121. It was tasty and apparently successful, but Leeds closed it to focus on Hank's. Too bad too, I really enjoyed Commonwealth, although the Scotch eggs at Small Fry are just as good. Presumably a cocktail bar would be easier to run than a full restaurant, so I don't think Leeds would close this the same as with Commonwealth. Twisted Horn will be at 819 Upshur Street NW. Right now they will only be open Thursday-Saturday: Thursday 5pm-1am and Friday and Saturday 5pm-2am. They have a website and mostly dormant Instagram and Twitter account too. The Post has an article about the city smelling like marijuana, and how most residents don't really care. I've definitely smelled it from time to time around our neighborhood, and it does seem like now I smell it more -- but I also wonder if some of that is bias that we're looking for it more now that marijuana is (kind of) legal in the city. In a Post poll, 57% of people say they smell it at least once a month, 45% of say they don't mind while another 17% say it doesn't bother them too much. If you recall, the law is that you can have up to 2 ounces of marijuana, you can grow it for personal use (up to 6 plants, no more of which 3 can be mature), and you can give it away (again, just 1 ounce.) You have to be 21 or older, you can't sell it, and you can't use it in public. That last part, however, is not enforced much by the police -- and that's fine with me. The Post quotes a few people who say they're less discreet now, and a lot of their examples take place in our fair neighborhood. It doesn't really bother me, but then again, I voted for the law and actually volunteered at polling places for Initiative 63, a medical marijuana ballot initiative that passed in 2002 but was blocked by Republicans in Congress. What do you think? Ok with it, or not so much? Whoa! 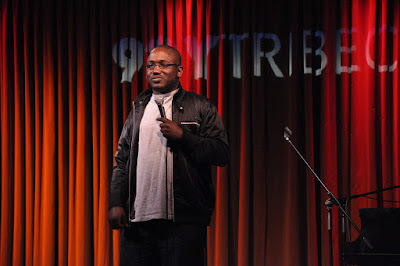 Comedian and actor Hannibal Buress did a surprise show at Wonderland last night, trying out some new material. He hosts Why? With Hannibal Buress on and is a recurring character on Broad City as Ilana's sort-of romantic interest, and made news last year as the guy who brought out Bill Cosby's sexual assaults into public knowledge. DCist has the story -- Wonderland hosts a free local stand-up night on Sundays, and after 16 other comedians, Buress walked up unannounced. He did a 40 minute set on politics, kids, social media and more. They report that before his surprise set, he was sitting at the bar next to a lady who knew who he was but didn't say anything, instead tweeting about him sitting there. Pretty funny and weird. He tweeted about the set just before it happened, but later deleted the tweet. 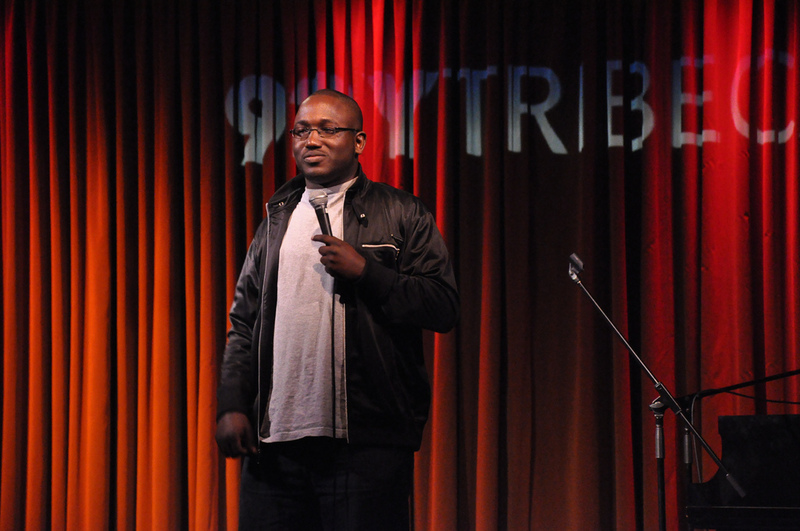 Here's Buress from a New York show in case the DCist tweet above doesn't work. 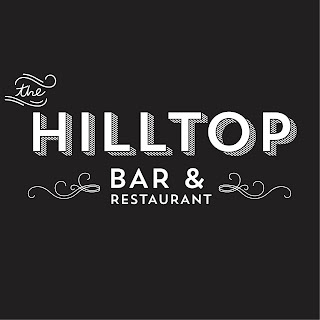 I've been looking forward to The Hilltop, the bar and restaurant coming to 2737 Sherman Ave NW: it's from two guys from the Saloon, the relaxed beer spot on U Street with a focus on beer and wine, but it's been a few years in the making. Other blogs reported in 2013 that it would be open in a month, and since then we've heard about permit issues and delays, which are normal when it comes to restaurants. We also heard they would open in September, but no dice. Some folks were worried it might not open, but I talked to co-owner Sam Jahanbeen about the spot, and he said they're aiming at Spring 2016 for opening. It sounds like they're on the home stretch, Jahanbeen said they have their liquor and zoning permits and are just working on their kitchen. They'll spend the winter developing and testing their food menu. According to their liquor license, heir hours will be 10am-1am Sun-Wed, 10am-2am Thurs-Sat, which suggests to me they'll have brunch. The outdoor areas will be 10am-11pm every day. Judging from their Facebook, the inside looks pretty far along. 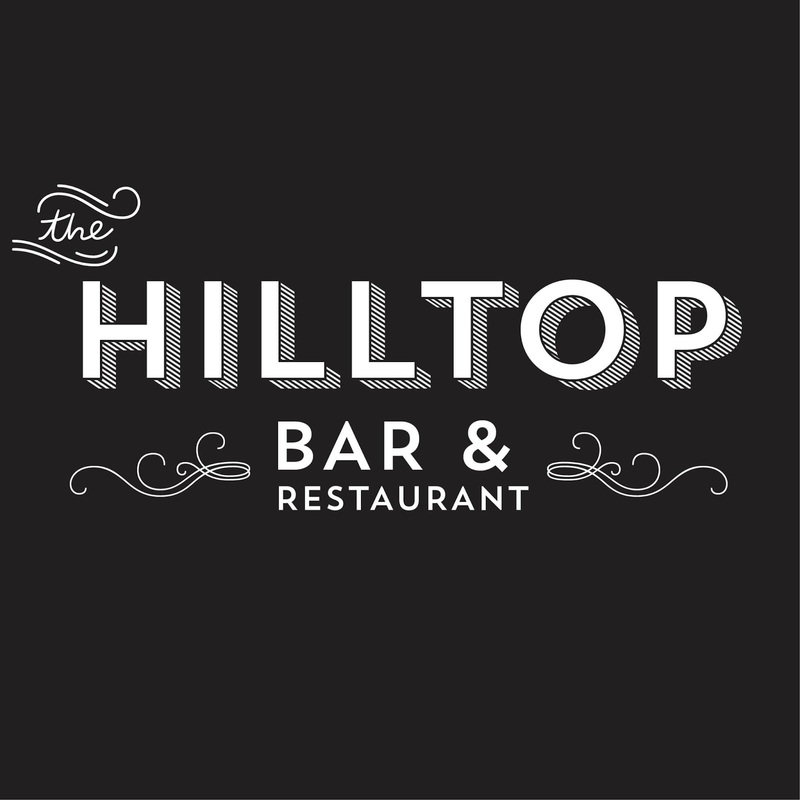 They'll be beer and wine focused, with probably most being American and European, and they're working on their food menu, which will be casual and American-focused. There's 36 seats inside and 40+ outside. Jahanbeen is the nephew of the owner of the Saloon and his co-owner Kaleabe Getaneh is a long-time waiter and manager there, and a super nice guy. With that kind of bar pedigree, this place sounds like a great addition. If you haven't been, the Saloon on U Street is a relaxed German and Belgian-beer bar, a great place to have a conversation with friends. They also raise money and close down every year to build schools, which is pretty cool. The before and after of the building is pretty nice too: it was a vacant building for a long time. I'm looking forward to this spot, and hope they're on track to open then. You may have heard about TED talks, the events where speakers talk about their ideas and their projects, and TEDx, the independently-organized TED events around the world. There's one in our area coming this Saturday, TEDxYouth@ColumbiaHeights, which is a youth-focused event targeting high school and college students, but anyone can attend. This is the second TEDxYouth@ColumbiaHeights, the first was in 2012. The speakers ar Mariam Adil, the founder of GRID, Gaming Revolution for International Development, which usess games for international development projects, Ana Alanis, a student at American University who is a youth activist, and Gabriel "Asheru" Benn, a hip hop artist and former DC teacher who also runs Guerilla Arts Ink, which trains local artists. Here's more about the event. Sounds interesting! And there's more info on their website. TEDxYouth@ColumbiaHeights was originally started in 2012. We are back in 2015 with a new team, new ideas and a passion for "ideas worth spreading." As an organization and an event, TEDxYouth@ColumbiaHeights seeks to connect youth in the DC community to new ideas, opportunities and each other, in order to build a space where students can grow as individuals in order to help them positively impact their communities. TED is an organization that's focused on ideas worth spreading and TEDxYouth@ColumbiaHeights is a local, independently organized TED-like event that seeks to connect students to new ideas, opportunities, and each other, in order to build a space where students can grow as individuals to help them positively impact their communities. This full day event (9:30 AM - 1:30 PM) targeting high school and college students from across the district will feature 11 speakers from a wide variety of fields to spark new ideas, conversations, and action through a series of talks and interactive activities relating to this year’s theme of “independence.” This year's speakers include a NASA program manager, an international hip-hop artist, a professional road tripper and more. Tickets for the event are $10 and are available on our website. Playback the Tape, the fun event where they screen old VHS tapes, commercials and all, is back in our neighborhood. 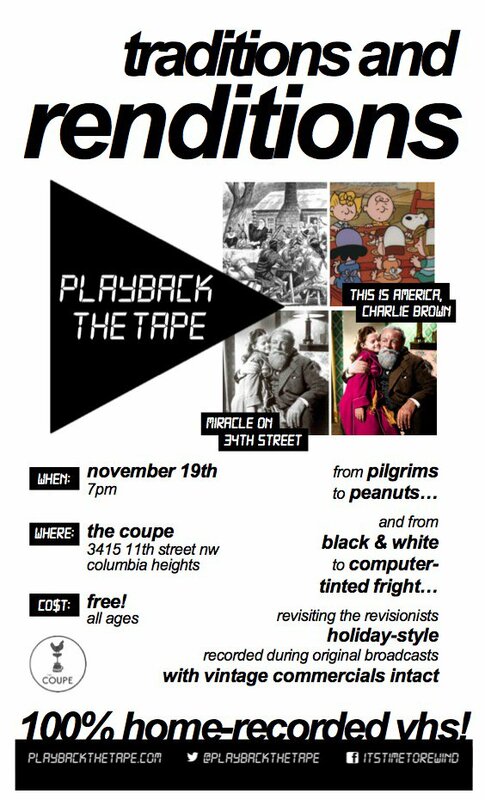 Their next event is tonight at the Coupe, starting at 7 pm, where they'll be showing Peanuts, Miracle on 34th Street, and other old holiday videos, all from home-recorded VHS tapes, which means they're complete with 80s and 90s commercials. The events are a blast, it's a fun blast of nostalgia. I went to one two Halloweens ago at the Mothership (RIP) where they showed a Garfield Halloween special, which included commercials for My Little Pony, GI Joe, Teddy Ruxpin and lots of other funny ephemera I'd forgotten about. El Latino Bakery, which makes the delicious smell on 11th Street, is closed! This is sad news for our sense of smell: it seems that El Latino Bakery at 3314 11th Street NW, has closed and moved to Maryland. It's too bad, I always loved smelling that sweet, doughy aroma over the area. Sometimes the smell went as far as 13th and Park. At least there are still other Latin bakeries in the area, especially up 14th Street. Which is your favorite? And I wonder what will come of that building -- they had a pretty big space. The other day, a reader emailed me asking about the procedures to host a block party, a party where the city shuts down the block and you have friends and neighbors take over the street for grilling, hanging out, games and the link. I wasn't sure the process, so I did some research and found out how and where you can host one. Applicant must obtain consent of 51% of households on the block. There are some other requirements too: according to DDOT staff I spoke with, the street must be categorized as a "local" street, which is why I created the above map using data from the DCGIS office -- green is local, red is everything else. You'll see that eliminates most of Columbia Heights south of Park Road. You can mouse over the street to see the name, and click it to see its "functional class" or street type. However, just because your street is categorized as a local street, it doesn't mean that the block party will automatically be approved -- the permit goes through various agencies like MPD, the fire department, and WMATA, and they can deny it if they find the street is too important, it will impede emergency vehicles, or other reasons. If it's on a Metrobus route, the party still may be approved if WMATA can redirect the buses safely and easily. In addition, it can't be on an official emergency evacuation route, but those are never local streets, so that is kind of redundant. To apply for the actual permit, you use DDOT's online permitting system called TOPS and choose "Parking/Occupancy permit." There seems to be no fee. A few other considerations: this will take some time -- getting people on the block to agree, getting the permit back in time and so on. I would start working on it as soon as possible. I hope this helps people have more parties! They are really a blast. And make sure you get a moon bounce, because they are awesome. UPDATE: A commenter noted that 11th Street is colored red, but Columbia Heights Day is held there. I believe that's because Columbia Heights Day is not a block party but a "special event," which is a different permit. Block parties can only be one block and can't sell alcohol, whereas Columbia Heights Day does both. Thanksgiving is coming up, and the folks behind the Petworth Community Market have organized a Thanksgiving food drive to support Mary's Center, a great local nonprofit that works on health care, education and social services. They'll have food bins at the Market on Sunday and also other local businesses until Nov. 20: Annie’s Hardware, Greenline Real Estate, Willow Fashion, Lighthouse Yoga and the Mary's Center office at 3912 Georgia Ave NW. The Petworth Market is every Saturday from 9am to 1pm at the triangular park where Georgia, Upshur and 9th Street intersect. Rock Creek Park is a great resource right in our backyard: there are trails for running, biking or hiking, places to work out, picnic areas, fields for games or just hanging out, historical sites like forts and old buildings, and a lot more. 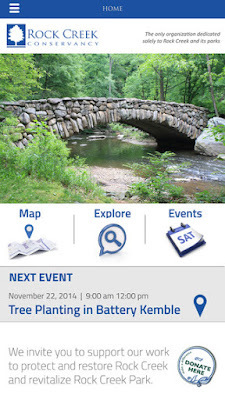 I wrote about the hiking trails before (as well as an album about the park), but I just heard about a cool new way to explore the park: the Rock Creek Conservancy app. 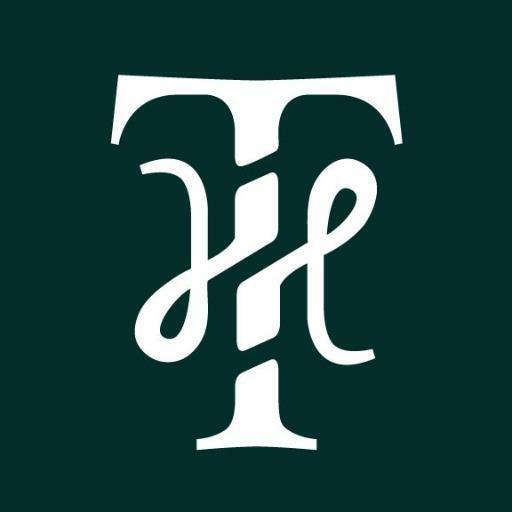 The Conservancy is a nonprofit that helps maintain the park and holds events like cleanups, and the app lets users find and learn more about tons of features of the park: trails and markers, streams, horse stables, boathouses (I didn't even know there was one!) Civil War forts and more. 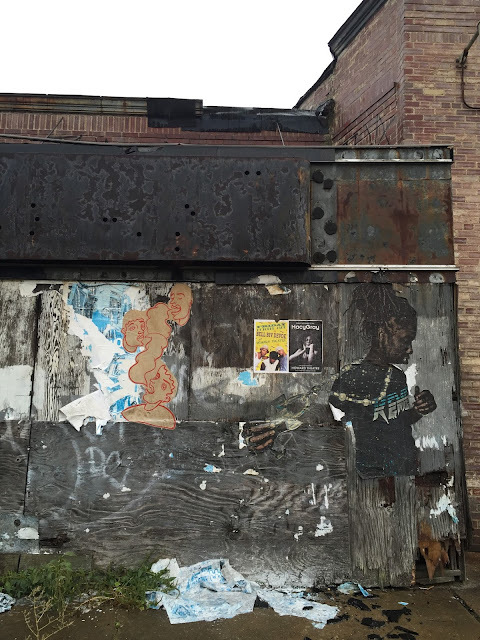 Here's more from the Conservancy, plus a survey about the app. Help us out! 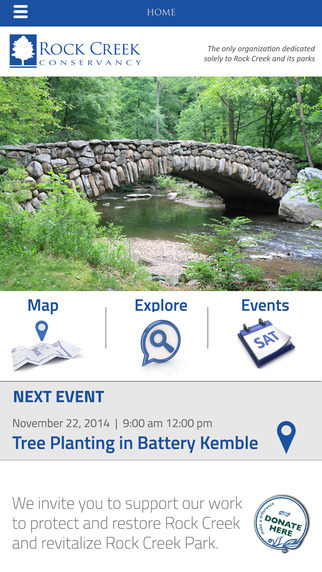 Download the app https://itunes.apple.com/us/app/rock-creek-conservancy/id994230942?mt=8 from the App Store and please take this survey https://www.surveymonkey.com/r/ZDCP3MN and provide your feedback. The survey takes less than two minutes and your input will allow for further fine-tuning, making sure the app is functioning perfectly. • Share adventures with friends through Facebook and Twitter integration. 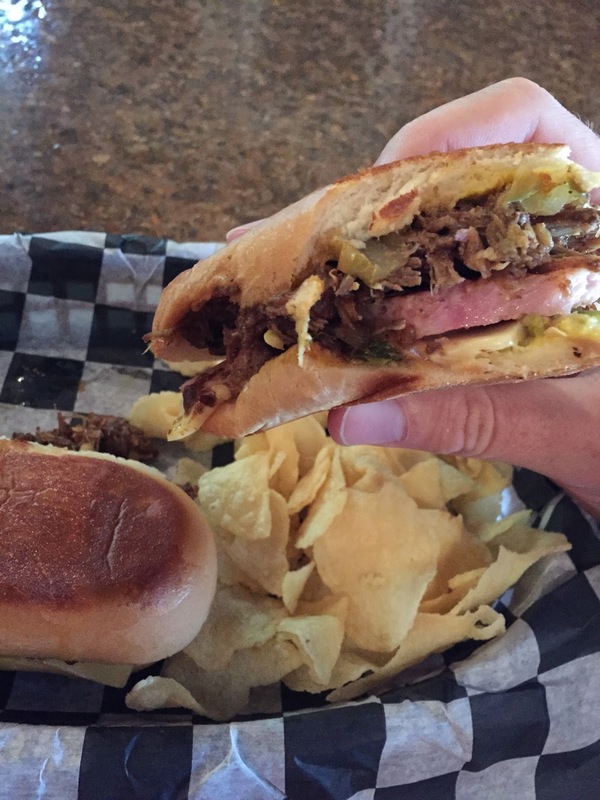 As part of my continuing Weekday Lunch series, where I check out local restaurants and food options for lunch during the week, I headed to Lyman's Tavern at 3720 14th Street NW, just south of Quincy. They used to open at 2 for lunch but have since changed that to opening the bar at 11 and the kitchen at noon, which is great. I stopped in a bit ago and got a fantastic pressed Cuban sandwich with ham, pulled pork, pickles, peppers and spicy sauce. It's probably one of my favorite sandwiches in the neighborhood so far. I've also had really good pulled pork BBQ sliders with spicy red cabbage there. All sandwiches come with chips and if I recall was about $9 or $10 with tax. They serve meatball subs on Monday some days too and they have tasty pupusas too. Also on the menu, which I haven't had yet, are tacos and more. I like the lunch vibe too, it's pretty quiet and relaxed, and on nice days you can sit at the outdoor bar area. And it's always fun to be able to play pinball with lunch. Definitely a good lunch option. Come out, meet your neighbors and help clean up the neighborhood this Sunday. Slate Properties and the DC Department of Public Works have organized a cleanup starting at 10am at 14th and Otis and they'll provide the supplies. Sounds like a neat way to help out and give back. Please join me in a local neighborhood litter clean-up day on Sunday, November 15, at 10:00 starting at the corner of Otis Pl. & 14th St. NW, brought to you with the support of Slate Properties and the DC Department of Public Works Helping Hand Neighborhood Clean-up Program. - Come by at the designated time to help clean up our neighborhood! I will provide materials (gloves, shovels, trash bags) and arrange for pick up. It’s that simple! 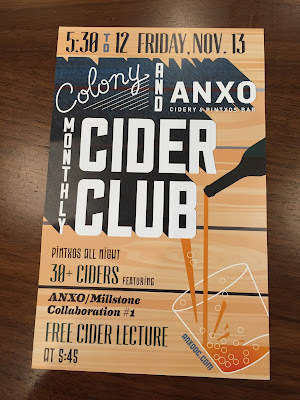 The event will have 30 ciders plus a lecture about cider and snacks from Anxo. Sounds pretty cool. Here's the latest installment of Weekday Lunch, my series about good places to eat lunch in the neighborhood during the week, maybe if you work from home or are just around. This time I stopped by Taqueria Habanero, the great spot at 3710 14th Street NW, down the street from the Red Derby.They make traditional Mexican food from the city of Puebla, and critics and regular folks alike love it (plus me), but I hadn't been for lunch. They don't have any special deals that I could see, but I got the red enchiladas, which comes with rice and beans, and an agua fresca (house made fruit juice), and it was all great and filling, running me about $14 plus tax and tip. 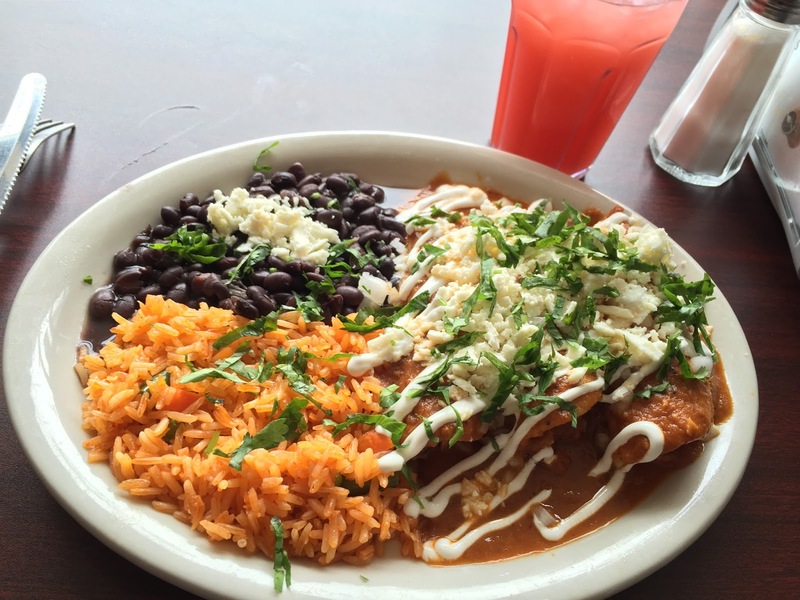 The tortillas are homemade and great, and all the ingredients are all fresh, flavorful and bright. It was topped with cheese and herbs, and the aqua fresca was an orange and watermelon mix. There was a decent crowd too, some families, some work from home types, but plenty of room. I suppose that's a little high for lunch, but it's really tasty! I highly recommend it, especially if you haven't been before. They also have their liquor license now, so you can get margaritas and cerveza. Update from DC SCORES: Poetry Slam coming soon, you can help too! 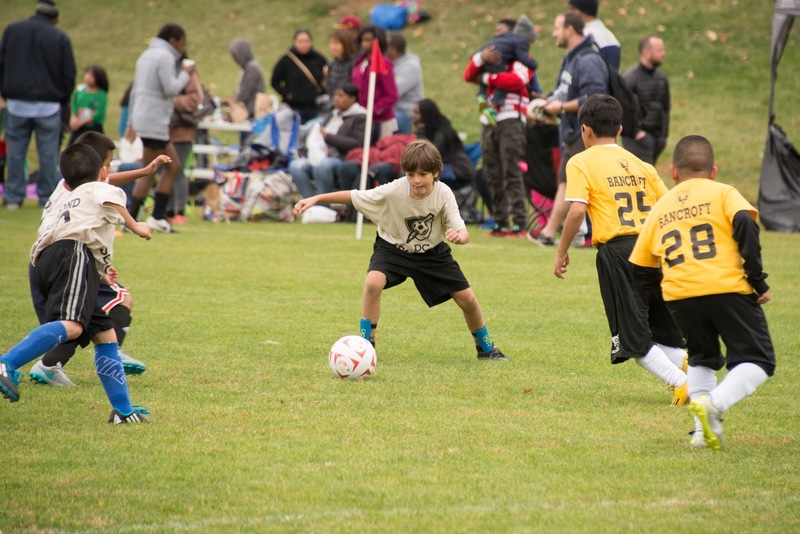 A few weeks ago, I wrote about a partnership that this blog and others have formed with DC SCORES, a great local nonprofit that provides after school programs for kids with poetry and soccer. Their season (both poetry and soccer) is underway, and their culminating event, the Poetry Slam, is in less than a month, Dec. 2 and Dec. 3. The event highlights kids from around the city, who perform their own original poems -- it's a celebration of their hard work and newly found skills, and also a great way for the community to cheer them on. If you're interested, there are two events you can check out, 5-8 pm on either Wednesday, Dec 2 at the Columbia Heights Education Campus at 3101 16th Street NW and Thursday, Dec. 3 at HD Woodson High, 540 55th Street NE. Both days are free and open to the public and you can arrive anytime during the event. Here's a couple of great videos about DC SCORES alumni, Ingrid and Xavier. Xavier was on MSNBC to talk about the program and Ingrid lives in Columbia Heights. The kids at Powell Elementary wrote a blog post about their experiences with some poems, and the kids from Brightwood Elementary had a training session with the US Women's National Soccer team. Here's more about the Poetry Slam and DC SCORES in general. The DC SCORES Poetry Slam! funnels the energy and creativity of youth into self-expression as a means of improving their literacy rates and raising their self-esteem. The students, ages 8-15, represent seven of the District’s eight wards. Whoa! My buddy was walking around the Columbia Heights Civic Plaza, the triangular plaza where 14th, Park and Kenyon intersect, and saw a few people wearing &pizza shirts looking at documents and such. He started chatting with them and they said they were looking at the space and working on getting permits for the former 826DC space. This confirms what Park View DC reported a couple of weeks ago (which I missed) but it's pretty good news to me! They'll have 40-60 seats and will apply for a liquor license too, presumably for beer and wine. 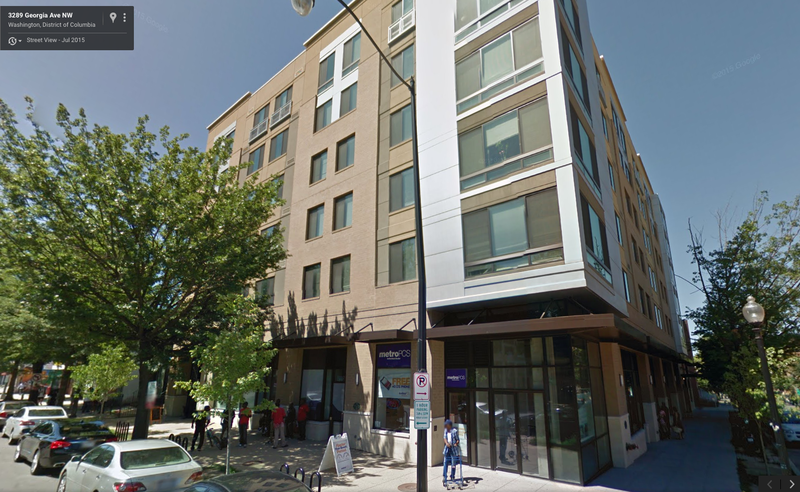 826DC is moving to the Tivoli building across the street. I like &pizza and fast casual stuff in general, and the Chipotle line is absurdly long at all hours of the day. If you haven't been, it's a setup like Chipotle or Potbelly -- you choose your type of bread, veggies, proteins and so on, it rolls through and oven, and then you can add a few more items. They also do salads and sides, and some locations have alcohol. I'm glad it's not a bank, cell phone store or some other boring tenant. 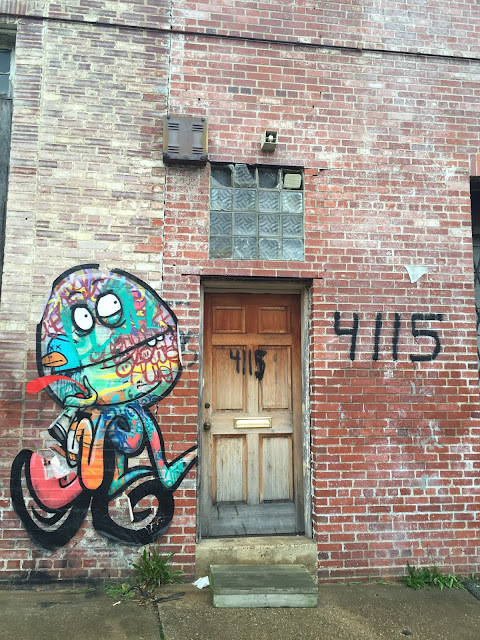 The other day I was up at Qualia Coffee on Georgia and wandering around, and I stumbled on this, a pretty cool abandoned building covered in graffiti at 4111 Kansas Avenue NW. Normally I'm pretty anti-abandoned buildings, as they mean no one is living there, no businesses are there, and nobody is paying taxes, but in this case, if it's going to be abandoned, at least it's interesting looking. The building is a warehouse owned by one William J. Deoudes, who lives in Maryland (thanks to the city's DC Atlas for letting me find that out.) He seems to be a real estate investor based on some basic googling. The building isn't categorized as abandoned or blighted, oddly, since it seems to be one or the other -- vacant means it's empty while blighted means it's empty and in bad shape. 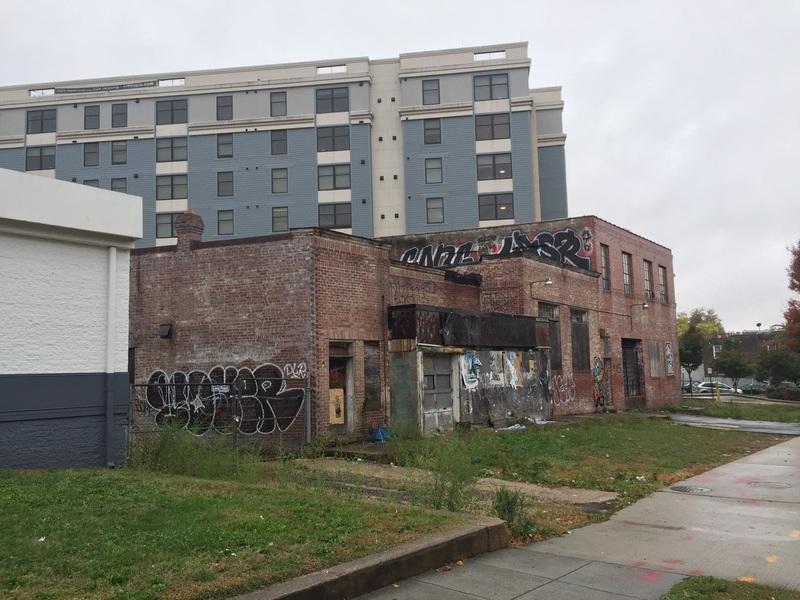 The idea is that owners of vacant or blighted buildings have to pay higher taxes on them so that they'll fix them up. I hope it gets fixed up into something productive. The art seems to be from various artists and there is both graffiti and paste-ups. I'm not sure who exactly they are, but pretty cool. The 32thirtytwo building at 3232 Georgia Ave NW is getting a lot of ground floor retail. Neighborhood Development Company announced that Salsa with Silvia, a local Latin dance studio will be opening, as well as Bikram Yoga Petworth, Metro PCS, Medical Center Orthotics & Prosthetics, and Re/Max. Yoga and dance are good additions in my opinion, since they'll presumably generate a lot of foot traffic, while Metro PCS and the others are kind of ho-hum in terms of foot traffic. That said, at least it's not another 7-Eleven. The building, at Georgia and Lamont, is an affordable housing building, meaning you have to have a certain income or lower to live there, which I think is a great thing for the neighborhood. Washington, D.C. – Salsa With Silvia, the Largest Latin dance studio in DC, will be gathering on Monday, November 9, 2015 at 4:30pm, with Neighborhood Development Company to celebrate the commencement of construction with a groundbreaking event. Special guests Brianne Nadeau, Council of the District of Columbia will be in attendance. Councilmember Nadeau, the Great Streets Small Business Grant program, and Neighborhood Development Company had an essential role in helping Salsa With Silvia provide continuous support to the local art community as well as contribute to the improvement of the greater streets of Washington, D.C. In 2015, the Great Streets Program awarded Salsa With Silvia with a grant in the amount of $85,000 for construction of its new location on Georgia Ave. The space will feature 2,600 sq. ft. of dance floor, luxury lobby, office space, and bathrooms. The vision of Salsa With Silvia is to promote the continuity of art in the already diverse and vibrant Columbia Heights neighborhood. In addition to the studio dance class program, Silvia and her team of instructors and performers volunteer and participate in a number of local school, government, and TV events to teach and demonstrate the beauty and positive energy of Latin dancing. The studio has plans to launch an after school, weekend, and summer dance class program for children and teens to help them stay focused while learning about dance and music. “After nearly a year of hard work in securing our new location and funding, making this dream a reality is a huge success for us and we look forward to providing the best dance and music education to children and adults in the community,” said Silvia Alexiev, Owner & Director. Silvia’s dance career goes back decades. An artist to the core, she earned a B.A. degree in Graphics & Web Design and an M.A. in Film & Video. Thousands of students and followers agree that the Salsa With Silvia studio offers the best Latin dance class and entertainment experience in the DMV. Since 2011, Salsa With Silvia has generated an explosive student growth as well as a worldwide online following. The new studio is set to open doors in the beginning of 2016. “We are thrilled to welcome Salsa with Silvia to our community and look forward to the studio opening next spring,” said Adrian Washington, CEO & Founder, Neighborhood Development Company. 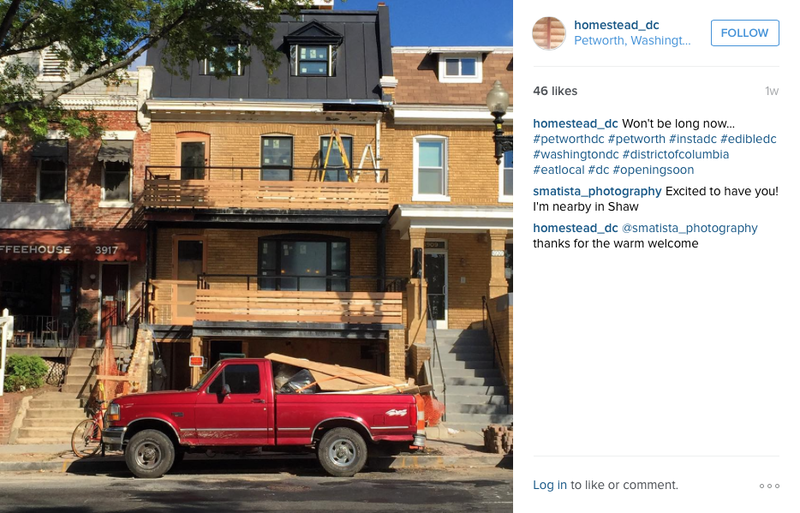 A few weeks ago I wrote about Homestead, the new bar and restaurant coming next to Qualia Coffee from some folks who are affiliated with the Blaguard, the Adams Morgan bar. I had a chance to ask them some questions and learn more. Owner Nic Makris gave me the rundown and said they don't have a timetable for opening but hoping to open in a month or two. 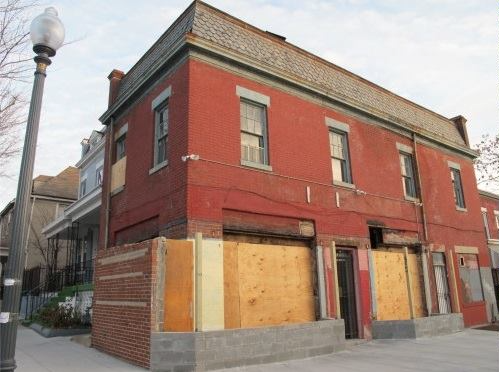 It'll be a neighborhood bar and grill with American food, game and locally-sourced cheese and charcuterie, plus lots of locals ciders on tap. They'll grow herbs in a roof garden and will try to use as much local, organic seasonal produce as possible. Chef Marty Anklam seems to have pretty wide culinary interests and tweeted about testing catfish nuggets for Homestead, which sounds pretty interesting. The space itself is pretty large, with about 80 seats inside and 80 more outside on multiple patios and decks on both floors. The second floor will be more of a bar with an indoor and outdoor bar area and back deck, and could be a good event space. They'll show sports and other things on the second floor's TVs, while the first floor is more focused on food, with a large chef table looking into the kitchen, which is pretty interesting. To me that sounds kind of like Meridian Pint's basement which has more of a bar vibe versus the main floor which is more restaurant-y. I'm looking forward to checking them out. Their website is up but is still under construction, and you can also follow them on Twitter and Instagram.